Just three miles from downtown and more than 1,200 acres of parkland, Jamaica Plain is the perfect spot for those seeking urban living in a suburban atmosphere. JP, as it’s known to locals, has long been home to a large artist community and progressive residents attracted to the community’s culturally diverse population. With stately Colonial and Victorian mansions, triple decker apartments and newly renovated condos and lofts, the architecture in Jamaica Plain is as diverse as the people who call it home. 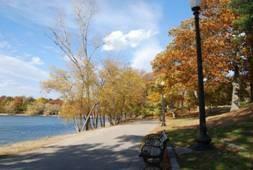 Boasting the most open green space in the City, JP is home to 3 parks of the famed Emerald Necklace; Jamaica Pond, a glacial kettle pond, the Arnold Arboretum, the 297- acre tree and shrub sanctuary and Franklin Park, considered the “jewel” of the necklace as the largest of the City parks, housing the Franklin Park Zoo and municipal golf course.